Earlier this year, Wisconsin received lots of attention after passing a law slashing the power of public employee unions. But soon after, Ohio legislators went even further. In March, Gov. 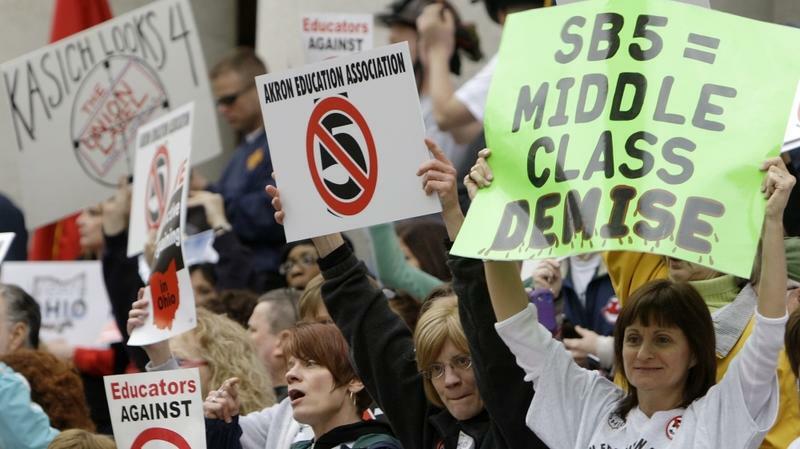 John Kasich and Republican lawmakers pushed a sweeping plan to slash union negotiating clout. It would ban strikes by all of Ohio's 350,000 government workers, require all public employees to pay at least 15 percent of their health care premiums, and use merit to decide pay and layoffs. Now, Ohio is getting attention because voters there will decide that law's fate on Nov. 8.